"Disney Junior Dance Party On Tour” caps a banner inaugural year with more than 120 shows in 2018 and a Pollstar Award nomination, honoring the top achievers in the live entertainment industry. This “musical extravaganza” (People) continues its run of quality family entertainment with another year of fun and excitement that’s “guaranteed to get your little tots giggling” (TimeOut) when it kicks off its 2019 tour on Friday, February 22nd in Stamford, CT. Tickets for the newly added shows go on sale Friday, January 18th. For details and announcements on additional upcoming dates, visit: disneyjuniortour.com/events. 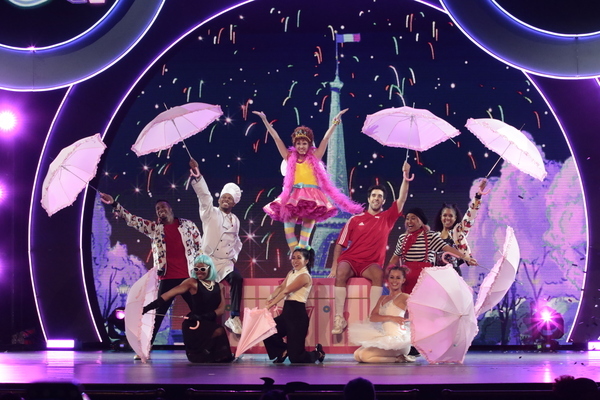 The 90-minute interactive show features the first live-action appearances of Fancy Nancy and Bingo and Rolly from "Puppy Dog Pals," as well as appearances by fan favorites like Mickey Mouse, Minnie Mouse, Elena of Avalor, Sofia the First, Doc McStuffins and Vampirina singing and dancing along to some of their biggest hits. Two VIP Package options are available for a pre-party and after-party, both with character greetings. Each VIP Package includes one premium seat to the show and a chance to meet favorite Disney Junior characters. Children and families can also enjoy pizza, snacks and beverages while participating in DJ hosted games and music. Each VIP guest will leave with a complimentary Disney Junior Dance Party VIP merchandise gift. “Disney Junior Dance Party On Tour” is directed by Amy Tinkham (ABC’s “Dancing With The Star”), produced by Red Light Management’s Jonathan Shank, and represented by Creative Artists Agency (CAA). Disney Junior reflects the emotional connection generations of consumers have to Disney storytelling and Disney characters, both classic and contemporary. It invites mom and dad to join their child in the Disney experience of magical, musical and heartfelt stories and characters while incorporating specific learning and development themes designed for kids age 2-7. Disney Junior's series blend Disney's unparalleled storytelling and characters kids love deeply with learning, including early math, language skills, healthy eating and lifestyles, and social skills. In the U.S., Disney Junior is a 24-hour channel and a daily programming block on Disney Channel reaching over 88 million U.S. homes. Globally, there are 36 Disney Junior channels in 27 languages around the world. With offices in New York, Los Angeles, Charlottesville, Nashville, Atlanta, Bristol and London, Red Light Management is one of the most innovative artist management companies in the industry. Founded by Coran Capshaw in 1991 when he began managing the Dave Matthews Band, RLM's roster now also includes Phish, Luke Bryan, Lady Antebellum, Alabama Shakes, Victoria Justice, Magic!, Lionel Richie and many more. RLM is a leader in live family entertainment having produced the national touring productions of Peppa Pig Live and The Octonauts, along with the Fresh Beat Band Live concert.